Yesterday, the White House Twitter accountÂ caused quite a stir when they tweeted the following photo of the President. 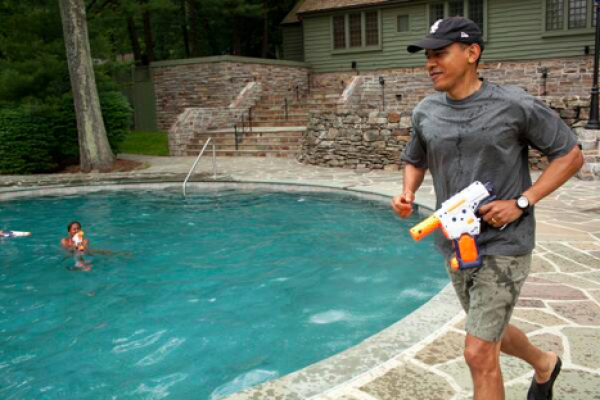 The photo is from 2011 and shows the President being a normal dad, playing squirt guns with his kids (and good on him for it). However, after all of the recent stories about children being punished for things like talking about guns on the school bus, bringing a quarter sized plastic toy gun on a school bus, wearing an NRA t-shirt, making a gun motion with an empty hand, making gun noises with a pencil, and making a toy gun out of a pastry, you can probably guess how well this photo was received by some. Still though, I say good for the President for playing with his children. Now if we can just teach our Commander-in-Chief trigger discipline. Wonder if he made that with a 3D printer? Hahaha comment of the week. And it looks as though he’s running too…bad!! !